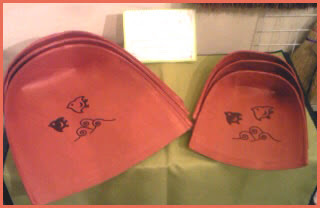 Small dustpans made of strong washi paper. They look almost like Daruma san himself. Some are plain red, others feature a small picture, like a bird or the face of O-Kame. The paper is made resistant with the extract of persimmons (kakishibu). They do not produce static electricity when used on tatami mats. 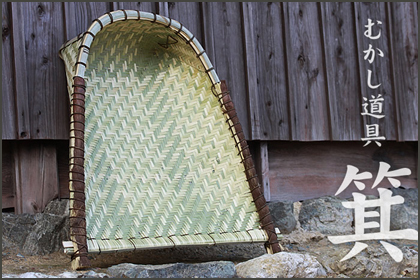 They are used with a soft broom to clean the tatami of traditional Japanese homes. This was a most useful tool for the farmers of old, usually made at home in the winter months with material that grows around the house. It was used for fanning grains and carrying vegetables. Now there are many maschines to do the work and these MI are shown in museums of farmers tools. This was done in a ritual with a feast just before the New Year. On the first birthday of a baby there is a special ritual. The baby is presented with a kind of rucksack containing (誕生餅) special birthday mochi and a winnow with a book, an abacus, a pen, scisors, a ruler, a hammer or other things with the wish for a bright future as a craftsman.
. Soroban, Abacus 算盤、そろばん Abakus . If someone gets ill, he has to stand at the entrance of the home, facing outside and the family members fan him with a 箕 winnow to make the illness go away.